This is an exclusive! It's the self-titled debut release from Black metal entity, Nordland. This has not been released to the public yet, but is due out soon via Glorious North Productions. The sole member is Vorh and Nordland comes from the North East of England. Vorscara begins with cleanly plucked guitar and the whistling wind which opens up this record in a very atmospheric way. When the music builds it does so with strong riffs and rasping vocals. The drums can be heard thrashing away in the background with the cymbals being the most prevalent. Nordland's sound is one of tuneful, ambient black metal, much like many of the other releases that have come from Glorious North in the past. Nordland chooses not too go for a clichéd sound, which makes listening to this record much more of pleasing experience. It true Black metal fashion, these songs are long and engaging! There are extended instrumental passages in Vorscara which help to maintain that foreboding atmosphere. Thule is more menacing, with faster drums and a very different guitar sound to that of Vorscara. The vocals range from those rasping, black metal screams to short whispered spoken word sentences. There's a lot of variation on display here, with the different vocals and changes in pace from fast to mid-paced, which are interwoven really well. The instrumentation in Morth is subtly melodic in places, with nicely layered guitar which comes to fore when the vocals are given time to rest. The harmonies give it a great multidimensional sound that makes it sound like there is a full band playing, and thanks too the great production it sounds very majestic. Morth does end suddenly, but then goes straight into Messenger of the Vortex Winds, which again demonstrates those great, layered guitar melodies. Here, the Norse influence begins to rear it's head properly. I hadn't really heard it in the previous songs but it's more obvious in this track. 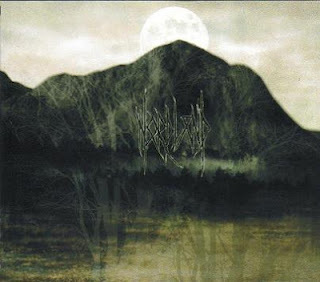 The lyrics are audible as well, which cannot be said for some black metal releases and as a result, you get a sense of the thoughts and subjects that Vorh sings about. Lords of The Great Dwelling is a slower more brooding song, which builds up to reveal a bouncing rhythm as the vocals kick in. This follows on from the previous songs and carries on the journey with a cosmic influence, with lyrical subject matter that includes references to Babylon, which nods towards a mystically presence within Nordland's influences. The guitar and piano that end Lords of The Great Dwelling is a nice calming touch that prepares you for the title track to come. Nordland is the longest song here, stretching to almost twelve minutes. It contains a more trance inducing set of riffs, but still have the evil vocals and clever drum patterns that keep things moving. Variation is the key here too, with changes in pace, stops/starts and subtle extras that make this a very rounded song. The noise level towards the end of Nordland seems to rise, as the guitars are left to play on their own briefly and as a result, sound massive. This is certainly a song full of great twists and turns, that should keep black metal listeners very happy indeed. The final salvo here is Nord Uliima, which is billed as an outro to the record. It feature subtle instrumentation and sporadic sampled chanting, which fades in and out along with more wind effects. It is a haunting but calm end to a record that's certainly been a journey! Nordland is another demonstration of Black metal done right. It's not trying to be too showy or corny, it's got integrity and considering it's play a solo project, the music contained on it sounds amazing. When it finally sees release through Glorious North Productions, I'd make sure you pick it up, because if word catches on it may start to disappear pretty fast! As I said previously, this records is due out soon via Glorious North Productions, so remember to visit http://www.gloriousnorth.co.uk/ for news about it. Also, Nordland has a website at http://www.nordland.org.uk/home. Bloody Gears - Frozen Rain 7"
Big Eyes - Back From The Moon 7"
Ashes Forever - Love, Leave, Forget, Repeat.